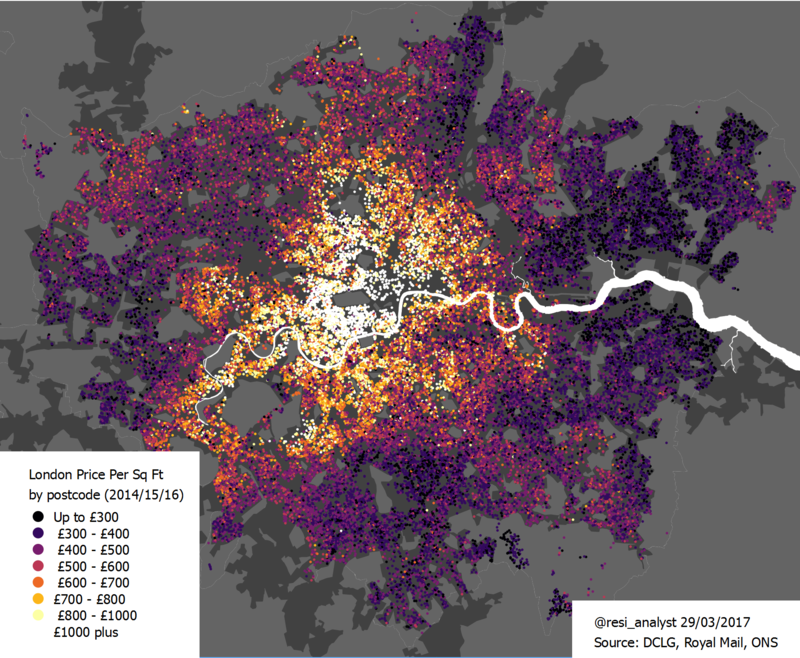 My guest blog for CaCHE on why we need to move beyond housing analysis and policy based on simple averages and aggregates. Quick map using showing the percent of sales during 2017 that were for more than £1million by local authority in England & Wales. Data based on HM Land Registry A&B data excluding ‘other’ property type sales. Will Building More Homes Help To Reduce Housing Costs? Recent years have seen growing public and political recognition that there is a crisis in housing. This has led to a widening debate on the causes and potential solutions. However, within this debate there has been little in the way of a consensus view of what constitutes the current housing crisis and what a “crisis-free” housing system might look like. There seems little clear idea of any measurable goal. The nearest we have as a target to aim at has been a series of aspirational numbers for new-build homes, with limited clarity on what to expect if we were to hit those numbers. Clarity about what success would look like is essential. Without a framework for what we need and want from housing, our ability to understand and fix it appropriately will be compromised. A lack of clarity also increases the risk of unintended consequences from misguided policy interventions. The current housing debate is “bedevilled by rival simplifications”. There are several quite often competing explanations for why we have a housing crisis. For many it is our failure to build homes at the same rate as projected household formation. This failure might be assigned to the planning system, the greenbelt, housebuilder business models, the land market, or NIMBYs. 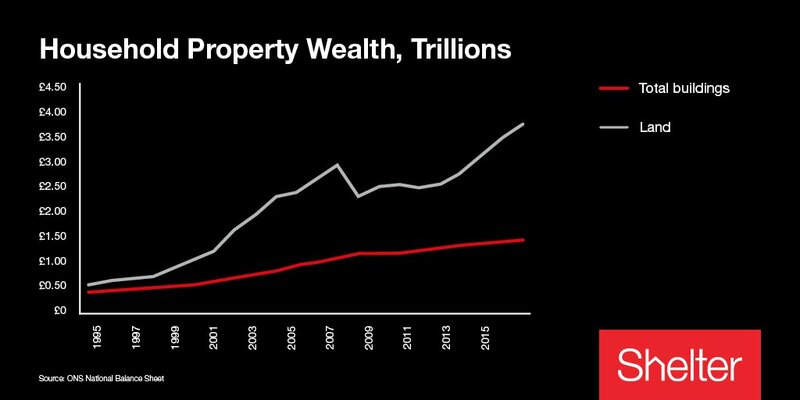 For others, the crisis is a result of falling interest rates, rising credit supply, low income growth, wealth and income inequality, tax incentives, or simply our fixation on house price growth. For some, there is no shortage of homes, rather a poor distribution. And for others there isn’t really a housing crisis. Despite the apparent contradictions in this mix of positions, each of the arguments that support these various views may hold significant elements of truth. Housing is a complex and interconnected system within the economy and society. There is no simple single housing market. There are multiple markets defined by location, property type, tenure, and price. Therefore, there is no simple single housing crisis. Instead we have multiple overlapping issues affecting different parts of the country in different ways and to varying degrees. There may be factors that influence all housing markets across the UK, indeed across much of the globe. There will be others that impact more locally and within specific housing sectors. So, for instance, there is growing acceptance by many experts that the cost and availability of credit has been one of the biggest, if not the biggest, drivers of increases in national house prices over the last twenty years. But it is not the only factor. The growth in buy-to-let has contributed to the financialisation of housing, with homes increasingly thought of as an investment rather than a place for people to live. A lack of supply is predominantly an issue for London and its surrounds, but there are localised shortages elsewhere, particularly of specific types or tenure of homes. Planning (including a lack of) and the land market limit the responsiveness of supply to rising demand. Housing is unevenly distributed, mostly across generations but also spatially and within generations. Some areas don’t need a net increase in housing but desperately need existing poor-quality homes improved or replaced. In many areas the biggest issue is low (or negative) income growth and employment insecurity. All these issues and others play a part in defining “the housing crisis”. Having a framework for what we need and want from housing, combined with an understanding of the complexities and interactions that run through the housing market, is essential to resolving the problems they create. A misunderstanding of the complexities of housing can be found in one of the most frequently stated explanations for the crisis: a lack of new supply compared with household projections. Unfortunately, this argument is flawed. Household projections are not a measure of housing demand. The effective demand for new housing is determined by the number of people or companies willing and financially able to buy property. Meanwhile new supply only accounts for around 12% of total transactions and probably less of available homes for sale. Importantly, even if some analysis may suggest there is no shortage of supply, that does not mean there is no need for new supply. Household projections are a statistical construct based on the past, not a direct measure of future housing demand. But they are still important if used appropriately within a framework for what we need and want from housing. If we are more explicit about the role of household projections in measuring housing need and the assumptions they contain, then the supply versus household projections argument might be recast as a debate on changing household sizes and the consumption of housing (both in terms of space and multiple properties). This then implies that we should be clearer about the minimum acceptable amount of housing people need, while also accounting for what they want. Should younger people still expect to form households at the same rate and size as their parents? The assumptions and projections around future household sizes should be moved from the background, where they are typically only discussed by planners and researchers, to the centre of the debate. They should be just one part of a framework for success that explicitly states what we need and want from housing (not just in terms of size but also cost, tenure, quality, security, and location) and better defines the minimum we are prepared to accept. That will provide a clearer understanding of where housing is failing to meet those requirements and help set objectives for how to fix it. These could then be applied appropriately across different markets. If measurement against the framework shows that households are not able to form at an appropriate rate and size relative to what they need, then we probably need to increase supply while possibly encouraging older households to move out of larger homes. If rents are too expensive then we may need to reform the rental sectors and increase supply. If housing quality is poor, then we need to work harder at improving and replacing existing stock. If many areas are struggling due to low (or negative) income growth and employment insecurity, then we probably need to look beyond just housing. It might even question whether we need to rebalance the economy and infrastructure investment away from London and its commuter zone. Having a framework for success may even highlight which issues we can fix and which we can’t. For example, it looks likely that we are stuck with a low interest rate and hence high house price to income market. 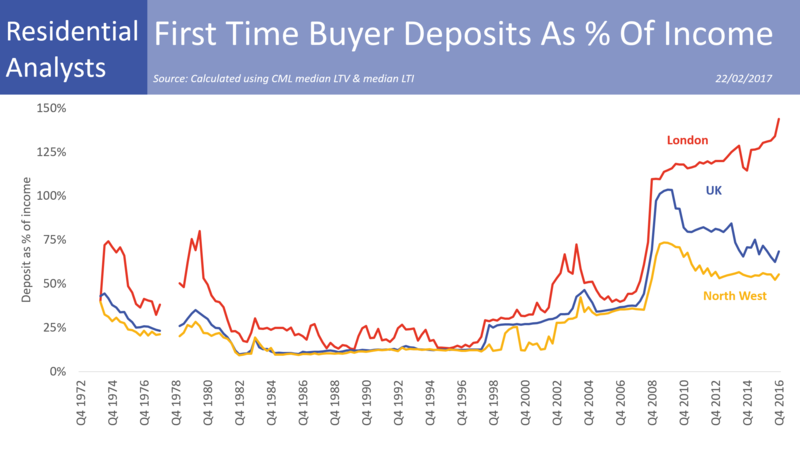 Under those conditions, prospective first-time buyers will continue to struggle to raise a deposit and access home-ownership irrespective of how much new supply can be realistically delivered. Rather than trying to return to the relatively short-lived 20th century ideal of mass home-ownership, perhaps we should be focussing our efforts on making renting cheaper, higher quality, and more secure as a long-term home. Increasing new supply would be an important tool in achieving that outcome. When we have a framework for what success could look like, our ability to understand and fix housing appropriately will be dramatically improved. It would be an important step towards making housing available, affordable, and appropriate for everyone that needs it. It would also be more useful than simply setting a nice round number national target for new homes. We may be getting better at building more houses but unfortunately we’re not very good at counting them. Last week the housing minister was citing the latest DCLG New Build statistics as proof that the country is building again. Completions across England had apparently reached 153,000 in the year to June 2017, ‘the highest level since 2008’. On this basis, the minister may be pleasantly surprised and slightly confused when he reads the DCLG’s Net Supply release in November and finds out that housebuilding completions had already reached 155,000 in 2014/15 and are actually much higher . The housing minister can perhaps be forgiven some excitement over the first release of housebuilding statistics during his tenure. Based on the average tenure of previous housing ministers, he’s probably only got another three or four to look forward to. However, despite some allowance for over-excitement, it is irresponsible for the housing minister to be quoting the New Build statistics as absolute measures of housebuilding as they under-count the number of new homes actually being built. It is particularly irresponsible because DCLG are well aware that there are issues with the New Build statistics. In the introduction to their New Build statistical release they suggest the New Build figures should only be ‘regarded as a leading indicator of overall housing supply’ and instead the Net Supply release ‘is the primary and most comprehensive measure of housing supply’. The scale of the under-count is apparent when comparing the New Build data to the more comprehensive Net Supply release. While the Net Supply release includes conversions, changes of use, and demolitions to calculate the net change in dwellings, it also includes a more comprehensive measure of housebuilding. The latest available Net Supply data for 2015/16 recorded 164,000 housebuilding completions across England compared to only 140,000 completions recorded in the New Build data. That suggests the New Build release is currently missing around 15% of the housebuilding market. Beyond the widespread confusion created by the publication of different housebuilding numbers, this issue has important consequences for policy makers. Our failure to accurately measure housebuilding and our limited understanding of who is doing the building make it very difficult to accurately assess the success or failure of existing policies and identify new ones that could increase new supply. The exact reasons for the under-count are not confirmed but it appears to be linked to the falling market share of the largest provider of warranties on new homes. NHBC provide a substantial share of the data used to create the New Build statistics and it’s been widely assumed that they have a market share of around 80%. Based on an assumed market share, the NHBC data is grossed up to provide a measure for the whole market alongside other sources of building control inspection data. However, recent years have seen a broader range of groups delivering new homes. Volume housebuilders still deliver the majority of new homes but there has been an increase in activity by SME housebuilders, high-density luxury developers, build-to-rent investors, and housing associations. For some of the firms and organisations in these groups, an NHBC warranty may be too expensive or not attractive compared to the alternatives. NHBC’s market share has probably fallen over this period. A fall in NHBC’s market share is apparently confirmed by the request for a review of its market undertakings from the Competition & Markets Authority (CMA). Although most of the market share data published by the NHBC and the CMA in the review is confidential, there is an interesting finding in the CMA’s provisional decision (paragraph 4.32). Using new home data from nine warranty providers including NHBC, the CMA estimated the NHBC market share at around 70% . If, instead of grossing up the NHBC data by 80% market share, we use 70% then we would expect the DCLG New Supply data to be around 14% higher (0.8/0.7). That difference would account for nearly all of the shortfall in the New Build completions when compared to the Net Supply housebuilding data. While there may be other factors causing the under-count, it would appear that this market share issue is the most significant factor. It would be great if we had an accurate and regularly updated measure of housebuilding but it turns out that counting houses is actually quite difficult. The Net Supply data is far from perfect and it’s only released once a year with a substantial delay but it’s the best we currently have. Meanwhile, in Ireland they’ve had the opposite problem with an over-count of new homes. Official completions data uses electricity connections but it turned out that the actual number of new build completions between 2011 and 2015 was 42% lower than the official figures due to a large number of re-connections. 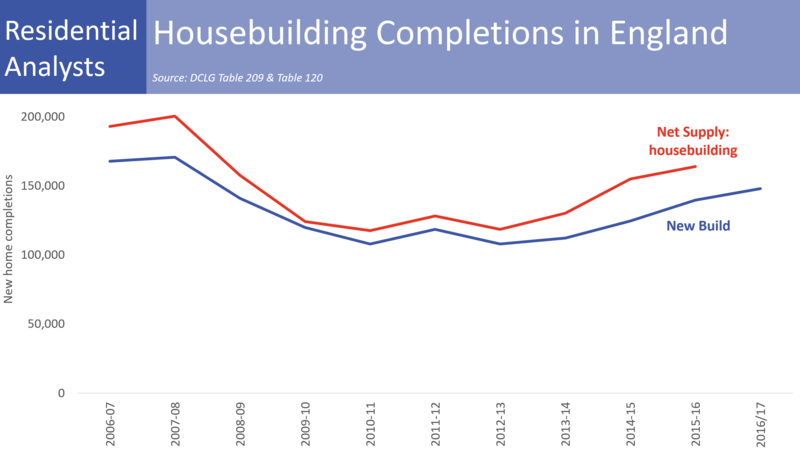 Until we see a substantial re-working of the DCLG’s New Build statistics, it appears the best option is to assess the full range of available indicators that cover both housebuilding and total supply. However, perhaps the biggest frustration is that DCLG are aware of the issues with the New Build statistics yet we still see quarterly political point scoring based on these flawed data. Given the complexities of the housing market, it is only once we move past this short-term politicking that we have any hope of solving the crisis.